By Adrian Shirk ( © 2016 Shirk, as first published on TheMorningNews.com ) In the early morning of October 1st, 2007, a volunteer for the Oregon Department of Fish and Wildlife approached the sturgeon pond at the Bonneville Dam and found it empty. There was no evidence of struggle, no footprints, no suspicious debris—just the still brown water where seven giant fish had been swimming the day before. Sturgeon in the Colombia Gorge at Bonneville Dam Oregon. Photo by Michelle Minor (Wikimedia Commons). Headlines like “Sturgeon didn’t walk off on their own” and “Game police pursue poachers” flooded the back pages of blogs and newspapers for little over a week. Photos of the five-foot-long, cartilage-cased creatures appeared in print like children on the back of milk cartons. The lead investigator couldn’t explain how the thieves had maneuvered past the locked gate next to I-84, or over the high fence that protected the dam’s hatchery. 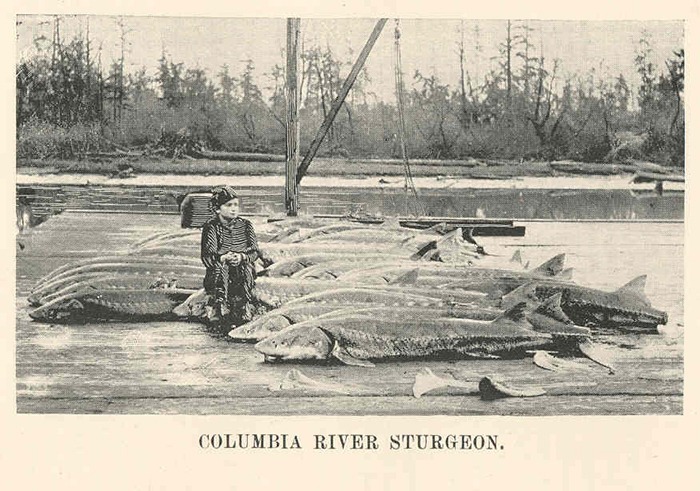 And, because sturgeon are enormous and impressively muscular, the sheer planning and manpower it must’ve taken to wrestle these 200-pound juveniles over the threshold made the feat seem disproportionate to its earnings: While mature sturgeon can produce hundreds of thousands of dollars in black market caviar, each of these fish were appraised at a measly $250 apiece. 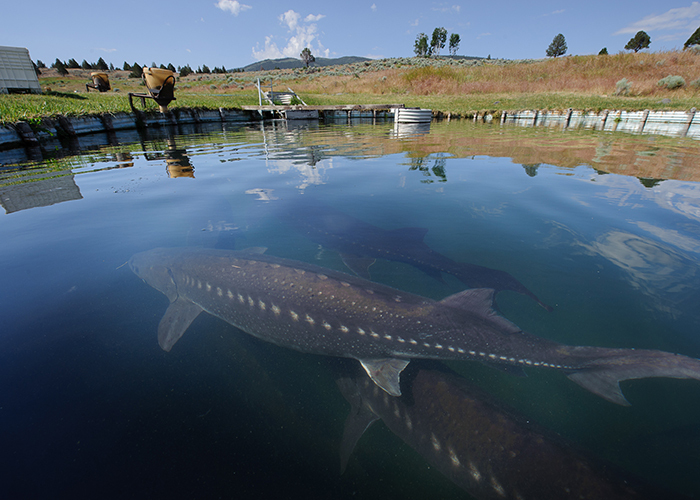 White sturgeon are the largest freshwater fish in North America, and Oregon’s Columbia River Valley lays claim to one of the last self-sustaining populations on earth. The species is not actually white but rather, as Brian Doyle clarifies in his essay “The Creature Beyond the Mountains,” “as gray as the moist lands in which it lives, the temperate rainforest west of the Pacific mountains and east of the not-very-pacific ocean.” The last of the bony freshwater fish, sturgeon are smooth and snouted and have the eerie, loping stroke of saltwater sharks. They’re rimmed in dagger-shaped plates called “scutes” and have virtually maintained their appearance from the dinosaur days, 200 million years ago. They can grow up to 20 feet long, weigh up to two tons, and live for 120 years, most of which they spend in the darkest reaches of the river floor. Needless to say, they are weird, and alluring, and the apple of Oregonians’ eye. As soon as reports of the theft came in, an online enthusiast’s forum at iFish.net flooded with a barrage of deeply impassioned comments, about the (as one user flagged it) “stomach turning” news: “something has to be done to people like that;” “Scum bags! ;” “What is the world coming to? ;” “That is terrible, those fish are so great to look at;” “I don’t understand what would make a person do something like this.” One hopeful user speculated that the culprits might have been radical environmentalists standing against animal captivity. Another was pretty certain it was meth heads. (A combination of both would be most interesting, though unlikely.) Later on, when I emailed the regional public information officer for ODFW to ask if there were, aside from caviar, any reasons—ornamental or ritual—why someone would have gone through the trouble to kidnap the sturgeon, he answered obliquely. “Many people consider their meat a most excellent source of protein, and some even compare it to lobster,” he wrote, and while that hadn’t been his experience exactly, they were “good eating.” When I pressed about whether ODFW ever got any leads on the culprits, he simply said they were not at liberty “to comment on who the thieves might be or what motivated them.” ​As a kid growing up in Oregon, the white sturgeon, and the conservation efforts of the Columbia River dams, were very much a part of my public education. Your power is turning our darkness to dawn, roll on, Columbia roll on was the song Woody Guthrie wrote about the Bonneville Dam for the Works Project Association in 1935, and the chorus we were prompted to sing on annual elementary school field trips there. Those tours were always the same. A government official walked us through the turbines, the spawning beds, and the windows looking onto the fish ladder where we’d watch Chinook and steelhead leaping against the current to get back home. White Sturgeon (Acipenser tranmontanus). Photo by Joseph R. Tomelleri (Wikimedia Commons). The sturgeon pond was always the last stop of the day. It was outdoors, set apart from the facilities, and surrounded in the deep shadowy green of Douglas firs. This was where the largest specimens were kept, including the eldest and most impressive captive—Herman. A couple of steps down brought you to an aquarium-style viewing window where, squished together with all your classmates, you could watch the fish drift ambivalently by. They were ancient, spooky, the last vestiges of the Triassic period, and they looked right at you. * * * * * The summer before the theft, my mother and I roadtripped across the Oregon in honor of my high school graduation. It was a funny act of observance in part because while my mother and I got along very well, we were not your Thelma and Louise-type bosom buddies who might divulge secrets and salve wounds as we crossed the high desert. Instead, we were rather silent about the things that haunted us most: my brother’s arrest, my stepfather’s illness, my imminent departure from home. Secondly, I don’t know how most people observe their graduation from high school, but this road trip seems to me now indicative of the peculiar no-frills celebratory style of the Pacific Northwest, that region which wrested itself from religious tradition and the “old world” and so finds itself without time-tested coming-of-age ceremonies. Instead of a fancy dinner or a new car, you drive with your mom into the wilderness until some inner voice says you’re ready to move on. We set out from our house in Portland on a drizzly afternoon, and stopped just forty-five minutes east at the Bonneville Dam. Still so close to home, I worried when my mother exclaimed, “We’re on an adventure!” and began to dig into the cooler of peanut butter sandwiches. As we strolled around the fish hatchery in the rain, I was burning from my first urinary tract infection, though I didn’t know what it was at the time. I couldn’t handle my mother’s looks of nervous pity, so I didn’t say anything—just pissed glass in the stone bathrooms at Bonneville’s gates and hoped it wasn’t something horrible. There’s nothing like revisiting a childhood pilgrimage site with your mother to make your first sexual malady feel like a ticking time bomb. She snapped my photo by the entrance sign, and then we wandered to the sturgeon viewing area. We stood at that picture window which looked into the green depths of the pond, and Herman, the 72-year-old, 10-foot, 450-pound white sturgeon drifted toward us from the murk. 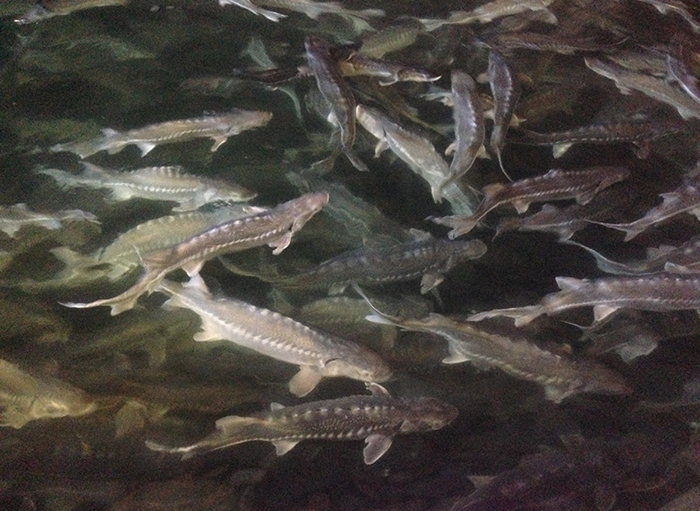 Sturgeon being grown for caviar production in a reuse aquaculture system. Photo by AndyyParadise (Wikimedia Commons). I’d seen Herman, who was actually female, in this habitat numerous times on those class field trips, but I felt newly haunted as she glided past the window like a prehistoric submarine. In the interpretive center, I read that the females don’t reach sexual maturity until they’re 17 or 18 years old, which is around the age they’re typically sought by poachers: split open, gutted of their enormous ovaries, which are switched like leather, beaten until tender, and plundered for their eggs. So for 18 years they float around and do what? Take in the sights, grow, sleep, avoid nets, eat sewage and crayfish and beer cans and candy wrappers that have sunk to the river floor. And if they’re not caught, do they follow this course ad infinitum, occasionally giving birth until they pass away at 100, 120-years-old? My mother and I drove east, chatting a lot but running out of things to really say. We stopped for milkshakes in a ghost town called Mitchell, and then walked along the town’s only street, which curved like a horseshoe. Most of the buildings were vacant, their Western facades still intact: a stagecoach, a package store, a defunct curiosity shop called “Whole in the Wall.” We checked into a two-story cabin called “The Oregon Hotel.” And then half way down the length of Main Street, in the middle of the road, we came across a cage holding a sleeping black bear. It was, I guess, just the kind of thing you sometimes find in Oregon. 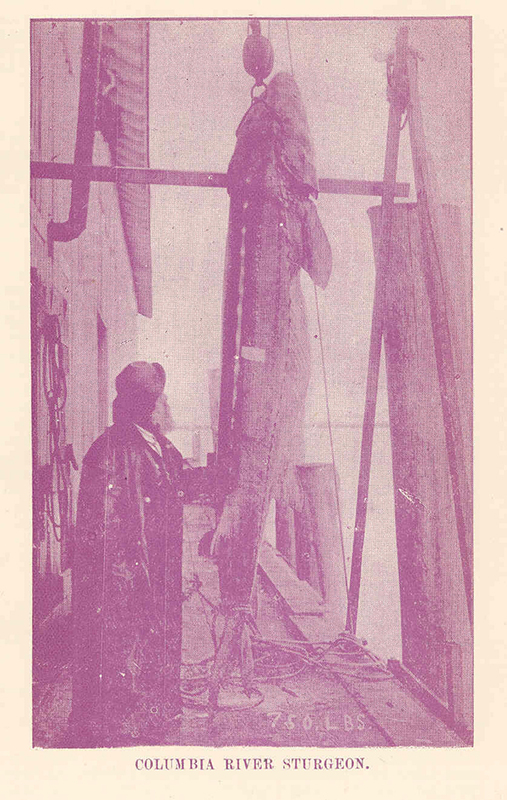 Colombia River Sturgeon, 1898. Photo by Freshwater and Marine Image Bank, University of Washington (Wikimedia Commons). Over the next few days, we drove and drove and weren’t ever sure where we were going. My mother sat next to me in her sunglasses and Columbia Sportswear gear, quiet and smiling. Occasionally she’d have hot flashes, and I’d have to help her out of layers while she kept her hand on the wheel. Maybe she was nervous because I was about to go to college, or I was nervous because I was detaching, but we didn’t talk about that. Rather, we pointed to things out the window or commented on weird details of the landscape on our walks. I grew anxious that I’d leave for good before we figured out what we needed to say to each other, whatever that was. We spent our last night in the back of her Forrester in a parking lot near Wagon Tire (Population: 2) reading Joyce’s “The Dead” the whole way through. “Well, that was weird,” my mom said, and then we clicked off the flashlight and gazed into the dark of the pine needles. The next day we drove sleepily toward Portland. All along the way, I kept thinking about the white sturgeon, and their ability to have outlived absolutely everything, to have never been in a rush, milling slowly, singularly, through the silty depths. How did they manage such perspective? Before the Columbia dams were built, they were anadromous, spawning in the river and maturing out at sea, but of course they are landlocked now. What does this feel like, to not be able to complete your life cycle? I suppose this would be a moot point if it weren’t for the fact that at this very moment, there are sturgeon swimming around that river who were alive long before the dams existed, who have been to the ocean, and who will never go back. * * * * * The first commercial fishermen of the Columbia River Valley must have been frightened when they realized they were surrounded. Bumping up against the annual migrations, or a giant old-timer breaching the surface, those white settlers no doubt, for a time, thought they were monsters. And are they? In fact, white sturgeon growth potential is so great that some scientists hypothesize a regular fasting period takes place in order to maintain ecological balance—an evolutionary trait that brings to mind some Godzilla-esque creature that, with fewer scruples, might overtake us. 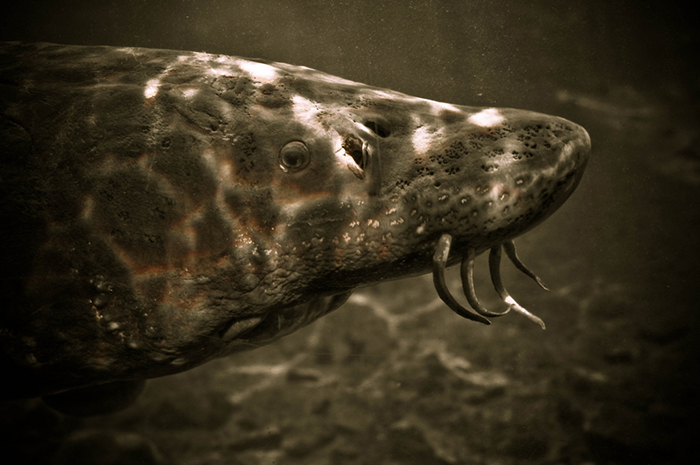 Sturgeon have often been mistaken for monsters of various kinds. The Menominee Indians tell a myth of Mashenamak (or “Big Sturgeon”), which was in the habit of devouring the village’s fishermen. So they called on a brave demigod who volunteered to be swallowed whole in an effort to prevent more widows. There’s a whole society of people who believe that the Loch Ness monster is a very old sturgeon. In 1987, one washed up on the shores of Lake Washington where a monster had been rumored to live for many years. 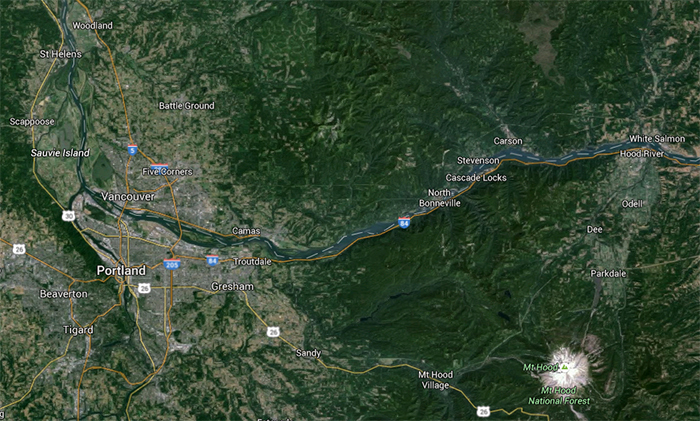 In middle school, my friends and I hung out on public docks overlooking the Willamette River in Southeast Portland. One time, perched in our usual spot in the rain, we saw what we perceived at the time to be a river monster. A long, charcoal-colored, eel-shaped thing floated by, belly up. We screamed. All at once, it flipped over and swam away, and we never saw anything like it again, and I imagine now that that, too, was a sturgeon. ​But their mystical sway was no contest for the visions of pioneers. Like the plains’ buffalo, sturgeon were among the first and greatest casualties of the expanding frontier. Just as the prairies were fabled to be once black with bison, almost every American river mythologizes that, prior to the 19th Century, sturgeon were so thick you could “walk from one shore to the other on their backs.” The white settlers of the Pacific Northwest had no desire to eat them. The white sturgeon were considered only a worthless interference in the face of the lucrative Rainbow trout and Sockeye and Chinook. So they were netted without discretion, dynamited, salted and sent to the Caribbean to feed slaves, or stacked upon docks as windbreakers. It wasn’t until the late 1880s that the Columbia River fishermen realized they could corner the caviar market for Europeans, but by 1900 it was too late. There were almost no sturgeon left. And yet their form is so tough and adaptable it has withstood warmings and coolings of all kinds, the dinosaurs, the meteors, and so, understandably, us. Moved, perhaps, by the fact that we saw what sturgeon sculptor Margaret Haydon calls “our own ancient history in their eyes,” or on the contrary, their complete indifference to us, or perhaps because of the faltering ecosystem, federal protective measures were taken just after the turn of the 20th century, and there’s been a strict size and annual catch limit enforced ever since. And just 100 years later people were risking life and limb to sneak into Oregon hatcheries to steal them. 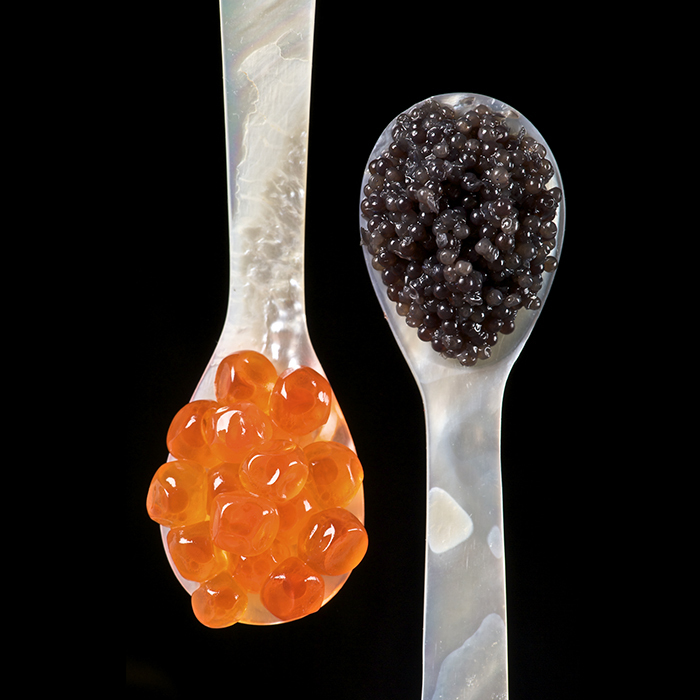 Mother of Pearl spoons with sturgeon caviar and salmon roe. Photo by THOR (Wikimedia Commons). Acipenser transmontanus grown for caviar at Willow Creek Ranch. Photo by USDA NRCS CA (Wikimedia Commons). Should they be poached again? The precaution seemed surreal if, in fact, the theft was purely driven by monetary gain. Hadn’t the thieves considered the law of diminishing returns? Was there some mystical reason for this tradition of poaching from the hatcheries? I thought about the Bonneville Dam itself, which, with the help of the nearby Dalles, John Day, and McNary Dam constructed in throughout the mid-20th century, all but destroyed Celilo Falls, an 11,000-year-old native fishing site thought to be among the most provident in all of North America. Celilo was still in use up until the state constructed the measly compromise of a fish ladder in 1957. What was once a craggy, massive crossroads of waterfalls, harvested with dipnets and spears, was altogether swallowed up by what was little more than a giant, government-ordered flood. What gifts could the steel spawning beds and the hatchery ever be? Did it mean anything to the river people to have a place where they could go look a sturgeon in the eye? * * * * * The Rhine River in Germany is home to the oldest European sturgeon stories. One of the most well-known is that of the Convent of Scwartz-Rheindorf. The sisters of the convent were permitted to all fruits in that part of the river, so long as the shoreman that did their fishing abided by one rule: every spring, two sturgeon came through the strait. The larger male would always allow himself to be caught, but the female’s freedom guaranteed the fisher’s continued productivity. In the spring of 1159, the abbess went down to the docks to survey what the fisherman had caught. There lay both sturgeon, each a slimy grey, netted with a variety of smaller fish. The hired man blanched and said it was an accident, quickly repairing to release the female, but the abbess stopped him. “It would be but folly to set one of them free,” she said. “The convent has not had such a treat for years past, and we absolutely require some change. I’ll warrant me they will eat delightfully.” And while the fisherman was wary, he went ahead and filleted the female the same as the male, and the sisters prepared for their feast. But when the time came for the sisters to lift the plate covers, each place setting was empty. The sisters were furious with the cook, and began to berate him when the old fisherman burst into the banquet hall. “My lady,” he said to the abbess, “it is the judgment of Heaven. Even now I saw the fish in the river… They floated away, swimming down the stream, and I am a much mistaken man if ever ye see them anymore.” As the story goes, the Convent Swartz-Rheindorf never again caught a fish off their banks, and moreover, that only because of the Reformation did sturgeon return to their waters. Of all the sturgeon stories, this is my favorite. The abbess’s intentions were benign, but the road to ecological hell is paved with good intentions. What if those rogue sturgeon thieves in Oregon were doing just that—letting the girl go free? Because you can always go poach your brains out in the Snake River, or down around Sacramento or up in Montana or all over the Southeast tributaries, and with much less of a risk than breaking into a padlocked government compound and wrestling them, one-by-one, over the gate. That’s not poaching, but something much stranger. Maybe they weren’t thieves, but mercenaries, restoring the river to its rightful order. Nearly every time I visit Oregon, trips that have become fewer and far between, my mother and I make a point of going out to Bonneville Dam to see the sturgeon. It’s always the same, and I’m not sure what, if anything, I’m expecting to see differently, in the way my mother and I weren’t quite sure why we wandered off into the Oregon outback at the moment we were parting ways after a life spent together in the same home, the last years of which I’d spent eking my way out. What had we thought we might find? We drove and drove and didn’t know where we were going. We walked to the edge of towns, where windfarms loomed and creaked, and around the Painted Hills with their layers of colored basalt, and we were silent. We found an abandoned homestead and stepped inside, its 1920s floral wallpaper peeling at the edges, boards splitting from dry rot. Beneath the boards were the bones of deer and raccoons, but deeper even, I knew, were saber-toothed tigers and camels from before the continent broke apart. We stopped when we could to have coffee or tea or just to sit side-by-side and look out some café window at a pretty view. We saw this creature that reminded us that the world is very old, and that life is actually very long, until it’s not.